Beacons: short stories and #climate. Launched in #Manchester on Thurs 7th March. MCFly talks to local writer Gregory Norminton about a new collection of short stories which is being launched on Thursday 7th March at the International Anthony Burgess Foundation, in Manchester. Please see disclaimer! Six years in the making, Beacons – stories for our not so distant future is a collection of original ﬁction by such established names as A.L. Kennedy, Alasdair Gray, Lawrence Norfolk, Janice Galloway, Liz Jensen and Toby Litt, as well as rising talents like James Miller, Adam Marek and Rodge Glass. Each of the stories responds to a brief: put simply, how does literature engage with the enormity if our ecological crisis? How do we root what we are failing to imagine in psychological narrative? How do we make a story out of a predicament? The book is above all a literary project, but also a campaigning one, with all author royalties going to the Stop Climate Chaos Coalition. earth, as a novelist, I could hope to approach a topic so enormous, so daunting and inescapable. I often ask myself that question, and have no convincing defence. I am a writer of stories. I am also a citizen, and as a citizen I am, to be blunt, scared shitless by global warming and our collective refusal to act on it. Being a writer, what else can I do – be it ever so futile – if not write? which, however wearily, looks to its politicians to save it. that have failed us. Our only hope, a thin one, lies in countering them with living stories: fictions that empower us to look our predicament in the face. In Beacons – stories for our not so distant future, some of Britain’s finest authors have attempted to do just that. Plenty. What is more demotivating, or less alert to the wonder of life, than a book without a laugh in it? Several of the stories (from A.L. Kennedy to Rodge Glass) offer laughter in the dark but at least one, Adam Marek’s ‘The Great Consumer’, is positively playful. 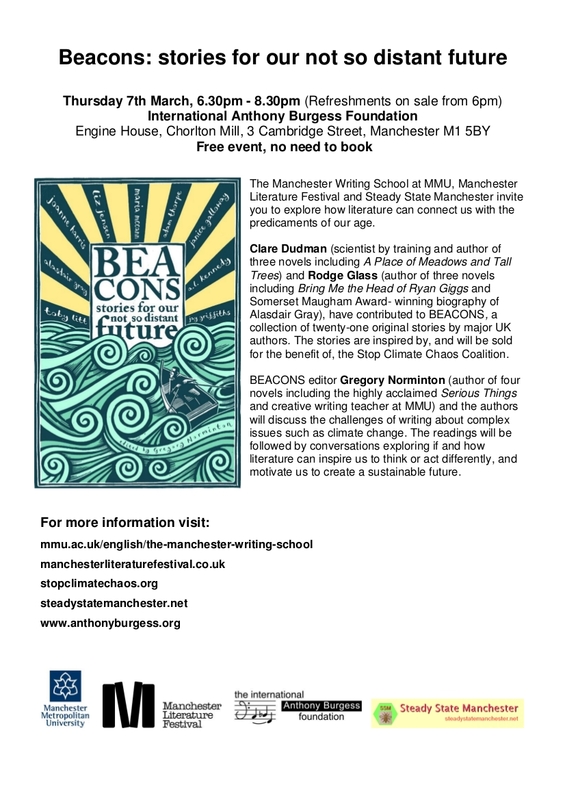 I can say this, being the editor and not its author: Beacons is not a depressing book! The inventiveness, eloquence and sheer talent of its contributors make it a real celebration of the creative spirit. And that’s something we’re going to need plenty of in the years to come. Please buy lots of copies. Disclaimer: MCFly is running a short story contest (it will be launched at the Beacons event). This has only turned from yet another idea scrawled on a bit of paper and stuffed in a document wallet into a real thing thanks to the hard work, intelligence and professionalism of Gregory Norminton, who is a top bloke. This entry was posted in Upcoming Events and tagged Beacons, Gregory Norminton. Bookmark the permalink.